Not every drywall surface repair will require new sheetrock installation. In a lot of cases, a simple coat of drywall mud is enough to hide gouges, blemishes and unfinished areas. 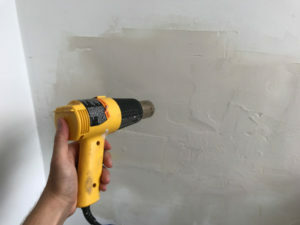 This short article will show you how to make simple mud patch repairs to your walls—and carry out the whole process in one hour or less! 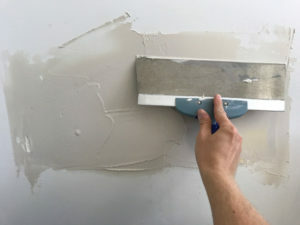 When most homeowners set out tackle drywall repairs, they usually purchase large, pre-mixed batches of joint compound. While these bucket-sized portions can be helpful for mudding an entire room, they tend to be overkill for patching small areas. Typically just a few cups are required for a small repair. The rest of the compound can be stored in a heavy garbage bag, tied off at the top to prevent the powder from taking on moisture. 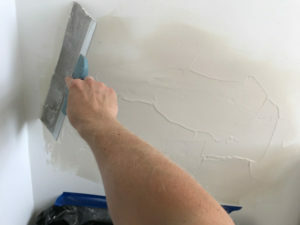 Sanding the wall provides the area with more “tooth”—a roughened texture that helps new mud grip the surface. Just use your drywall sander paddle to pass a low-grit mesh pad over the area in small circular sweeps. You want to scour a space several inches larger than the repair site itself. 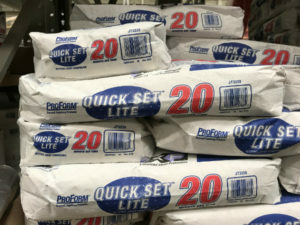 This will help us “feather” our drywall mud outwards. Pour just a little bit of water into your mud pan—about a ¼” depth is good to start out with. Now, use a cup to begin shaking the white joint compound onto the water in the pan. 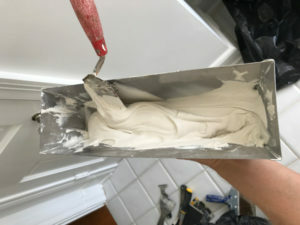 When you have covered the water with joint compound (the powder will mostly float on the surface), use your margin trowel to begin mixing the components. Drag the trowel edgewise through the center of the pan slowly. Sudden motions at this point will just cause a powder explosion. You want to very carefully swirl the two parts together until the water begins to soak the powder. When this happens, you’ll soon have a lumpy paste in the pan. You can now begin working the trowel through he compound more vigorously. Scrape the walls of the pans from time to time to pull the powder and paste towards the center where it can be mixed effectively. You want to achieve a consistency similar to peanut butter. (The mud should hold the shape of a groove if you drag your finger through it.) 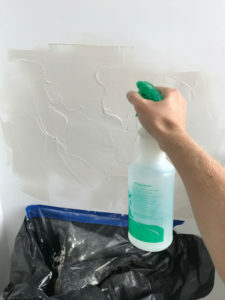 Also, you want to eliminate any chunks or bubbles in the mixture—pockets of air or dry powder will show up on the wall later. If your mixture seems too soupy, just add a little more compound. If it seems too doughy, splash in a little more water. A little experimentation will help you get the right combination. I have no idea why this occurs, but every good plasterer knows about it. The compound will seem to thicken prematurely at this point, but it’s nothing to worry about. It’s just a natural part of the chemical process. When the minute is over, begin mixing the mud again. It will quickly soften in the pan, and you can work it right back into the same smooth consistency. When you’ve finished thoroughly mixing after your false set, you’re ready to apply. Since we’re not covering tape seams in this project, there’s really no point to use anything but a 12” drywall knife for plastering. The wider blade will really help “fan out” the material. Just press the flat edge of the blade down into the compound and drag it towards the side of the pan. Now, scrape the blade up the wall in a smooth draw. This will separate the mud on the edge of the knife from the mud in the pan. If you do have some compound on the back of the knife, scrape it off on the sharp top edge of the pan. Also, make sure there aren’t any globs hanging off the sides of the knife. You want a clean “line” of mud sitting on the edge of the blade. Begin troweling the mud onto the area of the wall that needs to be repaired. Lay the thickest amount on the deepest part of the scarring, and work your way outwards. Keep a bucket half-full of water nearby for cleaning off your tools. (I kept mine in the bathtub for this project.) Scrape any excess mud into a trash bag, then clean out your mud pan thoroughly in the bucket. Let your pan and drywall knives dry to prevent rusting. 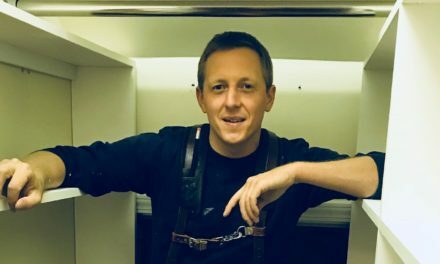 I learned this trick from a master plasterer. 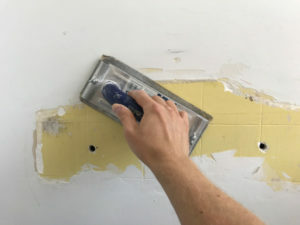 It’s a little difficult to get the hang of, but when you do, you’ll be able to speed up any plaster repair ten-fold! You want to wait until the drywall mud becomes a bit rigid on the wall. It’s hard to say for sure when this will happen. Various factors in your house (air temperature, moisture content) will cause the mud to dry faster or slower. For twenty-minute joint compound, though, it’ll generally occur after about 15 minutes. The compound will begin to take on a dull, greenish color. The mud will no longer move when poked or scraped. Wetting the mud at this stage will cause it to briefly “reactivate,” make it workable for just a few more minutes. With the area thoroughly soaked, begin scraping your 12” knife over the area—from the outer edges towards the center. If you’ve done this at properly, the mud will begin to smooth out. A slurry of dense mud paste will also build up on the edge of your blade. Keep it there! It will fill in tiny divots and pocks as the blade travels over the surface. There’s no need to go overboard here. You just want to flatten out the highs and fill in the lows on the wall. It will drastically cut down on the need to sand later, and it will also set you up for the next smooth coat! 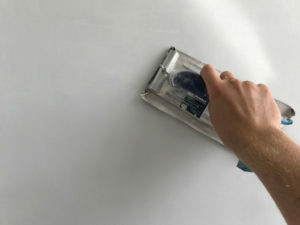 Painters and drywallers often speed up the set time of their work by using heat guns (pictured above) to dry wet paint and mud. If you’ve ever had paint mixed at a store, you’ve probably watch the associate use one of these tools to dry the paint dab they put on the lid of your bucket. I’ve come to utterly rely on heat guns for small repairs like this. They’ll simple enough to operate. Just plug the gun in, switch it on, and position it several inches away from your wall patch. Move the gun around in a pattern, passing it back and forth repeatedly over the entire area. The heat from the gun will cause the patch to “parch,” or go through the drying process very quickly. You can see this happen as the compound goes from a smooth, dullish gray to a rough, bone-white color and texture. Don’t let the gun point at any one area for too long! Keep moving it around until the whole area is relatively dry. You can set the gun aside when the patch is fairly dry. BUT BE EXTREMELY CAREFUL! The nozzle will be hot enough to burn anything it touches. Hang the gun up by the little hook provided, or set it on a stone or concrete surface if possible. At this point, you can begin the entire process over again. Lightly sand the wall patch with a medium-grit mesh, just enough to give it a little more tooth. Then, mix up another batch of joint compound and begin troweling it over the first patch. Take this layer out just a little wider than the first, still sweeping mud from the perimeter towards the center. You want to focus on getting a smooth finish this time around, so work with slightly smaller amounts of mud on your knife. When the second coat has begun to set up, repeat the spraying process, thoroughly wetting the area again. Trowel towards the center of the patch once more. 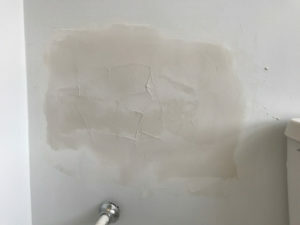 All traces of the old damage should be gone now, and your wall surface should look fairly smooth. Dry it with your heat gun (after cleaning your mudding tools). You’ll see dark spots start to emerge through newly dried areas after a few moments. This is moisture escaping from deeper regions of the patch. Continue passing the heat gun over these areas until no new dark spots emerge. If you want to walk away for a little while at this point, it can’t hurt. 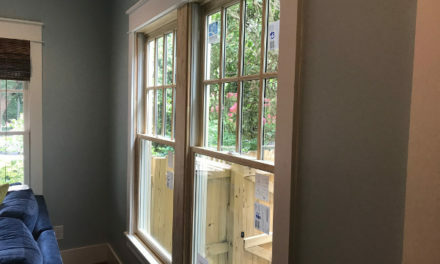 In a warm, dry house, the 20-minute mud will finish drying pretty quickly. When the whole patch is bone-white and extremely hard, use a fine-grit mesh on your sanding paddle to sand the entire area. Feather the perimeter carefully—you can scar the old paint and drywall around your patch if you’re too aggressive. If everything goes according to plan, you should have a well-blended patch ready for primer and paint! Obviously there are some skills that need to be practiced in order to make this process routine. But, drywall mud is really pretty forgiving, and you can attempt as many coats as you like. Just use smaller amounts of mud for each subsequent coat. And ALWAYS be careful with the heat gun. With twenty-minute mud and a few drywall tools, you’ll be able to patch up superficial drywall damage throughout your house in record time! 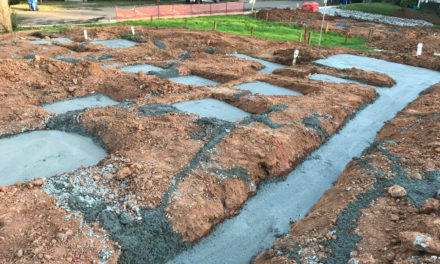 NextHOW DEEP SHOULD YOU DIG YOUR FOOTINGS?